Human rights violations committed by ISIS are condemned the world over – rightly so – whereas those committed by the US-led coalition fighting ISIS are under-reported, particularly in the West. What follows is a selection of the latter – a selection that strongly suggests the coalition’s military strategy is compounding the humanitarian crisis in Iraq. 21 January 2011 – Human Rights Watch releases a report stating “[a]fter 2003, militias, insurgents, Iraqi security forces [ISF], multinational forces, and foreign private military contractors raped and killed women” in Iraq. 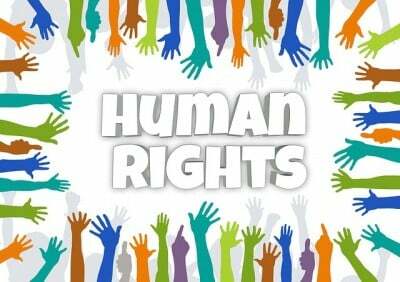 Following “the US-led invasion of 2003, the deterioration of the security situation in Iraq has promoted a rise in tribal customs and religiously-inflected political extremism, which have had a deleterious effect on women’s rights”. 11 March 2013 – Amnesty International releases a report stating that the Coalition forces, throughout their presence in Iraq until 2011, “subjected detainees to torture and other ill-treatment and were also complicit in serious violations of human rights committed by Iraqi security forces.” The report notes “[m]any detainees were transferred by Coalition forces from their custody to that of the Iraqi authorities in the knowledge that this would place such detainees at grave risk of torture or other abuses.” Amnesty International expresses concern that the mistreatment of prisoners by the Government of Iraq is likely to “continue to prevail and may even worsen”. 26 April 2013 – The International Crisis Group reports that on 23 April 2013, Iraqi security forces use force to end a demonstration in the town of Hawija in Kirkuk governorate, resulting in “over 50…killed and 110 wounded”. The incident is just one of many comprising the 2012–13 Iraqi protests, which are driven by the marginalisation of the Sunni Arab population in post-Saddam Iraq. The Government’s harsh suppression of these protests has exacerbated the sense of exclusion among a sizeable proportion of the Sunni population. 4 January 2014 – Human Rights Watch calls on Iraqi authorities to “immediately order a transparent and impartial investigation into violence between security forces and antigovernment protesters in the western city of Ramadi” that on 30 December 2013 “left 17 people dead”, and into “the apparently related killings of the brother and five bodyguards of a member of parliament, Ahmed al-Alwany, during his arrest” on 28 December 2013. 12 January 2014 – The International Criminal Court is presented with a “devastating 250-page dossier, detailing allegations of beatings, electrocution, mock executions and sexual assault [that] could result in some of Britain’s leading defence figures facing prosecution for ‘systematic’ war crimes.” The court acknowledges there is little doubt that British forces committed war crimes between 2003 and 2008. 6 February 2014 – Human Rights Watch releases a report on the systemic abuse of women in Iraq’s criminal justice system in the aftermath of the US-led invasion of Iraq. The report accuses Iraqi security forces of conducting “random and mass arrests of women that amount to collective punishment of women for alleged terrorist activities by male family members, often their husbands.” Despite being approximately 20 per cent of the total female population of Iraq, an overwhelming majority of women held in Iraqi prisons are Sunni Arab. Reported cases of abuse include “threats of, or actual, sexual assault (sometimes in front of husbands, brothers, and children)”, burning with cigarettes, “sexual torture” which sometimes “resulted in pregnancy” or physical disability, and “beatings, electric shocks with an instrument known as ‘the donkey,’ and falaqa (when the victim is hung upside down and beaten on their feet)”. 3 March 2014 – US journalist Dahr Jamail reports, “[d]octors, residents and NGO workers in Fallujah are accusing the Iraqi government of ‘war crimes’ and ‘crimes against humanity’ that have occurred as a result of its ongoing attack on the city.” According to “Dr. Ahmed Shami, the chief of resident doctors at Fallujah General Hospital, …since Iraqi government forces began shelling Fallujah in early January 2014, at least 109 civilians have been killed and 632 wounded”, including women and children. 13 May 2014 – The International Criminal Court announces it is to conduct “a preliminary examination of what have been estimated to be 60 alleged cases of unlawful killing and claims that more than 170 Iraqis were mistreated while in British military custody during the conflict” between 2003 and 2008. 11 July 2014 – Human Rights Watch uncovers “mass extrajudicial killings [that] may be evidence of war crimes or crimes against humanity”. Human Rights Watch claims “Iraqi security forces and militias affiliated with the government appear to have unlawfully executed at least 255 prisoners in six Iraqi cities and villages since June 9, 2014”, of whom “[a]t least eight…were boys under age 18.” The vast majority of the perpetrators are Shi’a security forces and militias, while the murdered prisoners were Sunni. 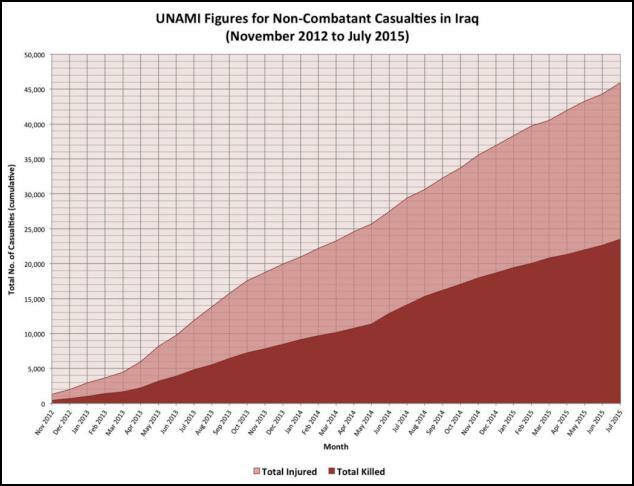 18 July 2014 – UNAMI (United Nations Assistance Mission for Iraq) releases a report that details violations against civilians committed by the Iraqi security forces and affiliated militias, including “extrajudicial killings, and at times [carrying] out military operations without due respect for the principles of proportionality, distinction and the obligation to take all necessary precautions to protect civilians from the effects of violence, which may also amount to war crimes.” According to the report, UNAMI has received credible reports of “children [aged 13 to 18] increasingly being recruited by militias from all sides, including those supported by the [Iraqi] Government.” Enlisting children under the age of 15 is a war crime. 23 July 2014 – Human Rights Watch documents “17 Iraqi airstrikes that killed at least 75 civilians and wounded hundreds of others, including six attacks with barrel bombs…in Fallujah, Beiji, Mosul, Tikrit, and al-Sherqat.” Victims include women and children. 13 September 2014 – Human Rights Watch documents an Iraqi Government airstrike “that hit a school housing displaced people near Tikrit on September 1, 2014”, killing “at least 31 civilians, including 24 children, and wounded 41 others.” According to survivors, there were no fighters from ISIS or other military objects in or around the school at the time. 13 October 2014 – Amnesty International documents cases of “torture and deaths in custody of Iraqi Government forces” and abuses against civilians such as “abductions and unlawful killings…all over the country” by “militias, often armed and backed by the government of Iraq, [that] operate with varying degrees of cooperation from government forces – ranging from tacit consent to coordinated, or even joint, operations” – as well as “in cooperation with or at least with the tacit consent of Kurdish Peshmerga forces”. 2 November 2014 – Human Rights Watch reports Iraqi security forces and pro-government militias massacre 34 civilians in a mosque in Diyala governorate. 14 December 2014 – The International Criminal Court is to consider “[h]undreds of new cases accusing British soldiers of abusing – in many cases torturing – Iraqi men, women and children, aged from 13 to 101”, covering the period 2003 to 2008. A New Zealand Defence Force contingent worked alongside British forces from September 2003 to September 2004. 17 December 2014 – Reuters reports Iraqi forces have established “death zones” around Baghdad. 1 January 2015 – Iraq Body Count concludes “[t]he rise of [ISIS] as a major force in the conflict, as well as the military responses by the Iraqi Government and the re-entry of US and Coalition air forces into the conflict, have all contributed to the elevated death tolls” in 2014. 10 January 2015 – Australian media confirms Australian Special Forces are providing “training and assistance” to the Iraqi Counter-Terrorism Service (CTS), a CIA-supported “elite Iraqi security force accused of killing prisoners and other human rights violations,” including “torturing detainees with impunity” at a secret detention facility in Baghdad, and allegedly being “responsible for major war crimes and unnecessary civilian casualties”. 26 February 2015 – Human Rights Watch implicates Kurdish forces in “apparently unlawful conduct”, of having “confined thousands of Arabs in ‘security zones’ in areas of northern Iraq that they have captured since August 2014” and barred them from returning home, and also of having “destroyed dozens of Arab homes”. 1 March 2015 – Aid agencies warn coalition plans to retake ISIS-held population centres could greatly worsen the humanitarian crisis. The UN World Food Programme estimates “numbers fleeing an impending battle for Mosul in the course of the next few months could total a million” if the Iraqi army, backed by US airstrikes, seeks to recapture the city later this year. The International Committee of the Red Cross, too, has “issued a statement warning of a mass flight from Mosul”, and the World Health Organisation believes “an attempt to recapture Mosul could lead to hundreds of thousands seeking refuge in [Iraqi] Kurdistan.” Complicating matters, ISIS is increasingly becoming entrenched in civil society in areas under its control. 21 May 2015 – After months of denials, the Pentagon for the first time admits US-organised coalition airstrikes in Iraq and Syria are resulting in civilian deaths. While there is a legal consensus on the lawfulness of coalition operations in Iraq so long as they remain within the consent of the Iraqi Government, some coalition partners are reluctant to intervene openly in Syria because of concerns over the legality of such military action. The case for coalition operations in Syria, such as the US and Canada’s airstrikes, is controversial in that they may be inherently unlawful. 30 May 2015 – Human Rights Watch issues a new release, stating “Iraqi authorities are preventing thousands of families fleeing the fighting in Ramadi from reaching safer parts of the country.” As a result, some are said to have died. 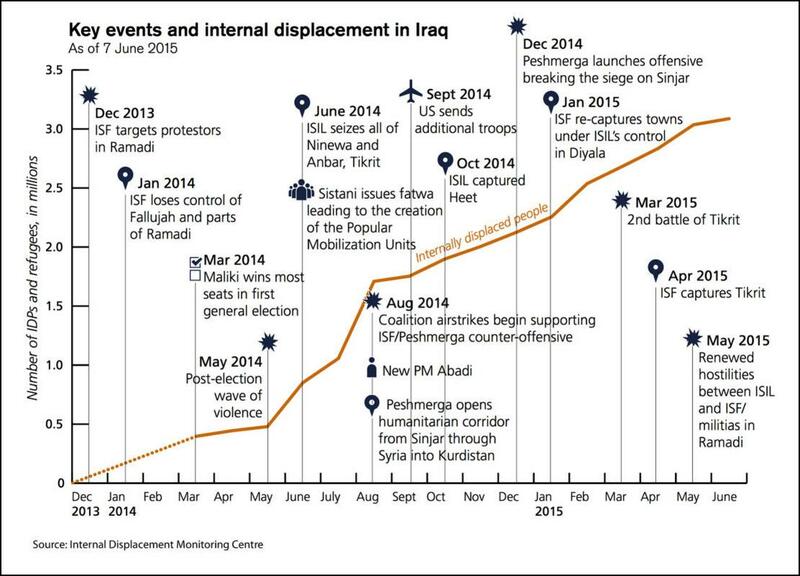 2 June 2015 – A Human Rights Watch investigation reveals that “when Iraqi forces ousted ISIS fighters from Salah al-Din province in March and April they went on a rampage, burning down or blowing up hundreds of residents’ homes and shops”. As a result, “tens of thousands of Iraqis…remain displaced, often too scared to return to their homes that remain under the control of the Popular Mobilization Forces (PMF).” The PMF is an Iraqi state-sponsored umbrella organisation, mainly composed of Shi’a militias and volunteer fighters. The organisation was formed in June 2014 for deployment against ISIS, following the fall of Mosul. 7 June 2015 – The Defence Minister of New Zealand reiterates his government’s position that Iraqi Prime Minister al-Abadi “is doing his best to try and bring together two very disparate groups of people in the name of a modern, free Iraq” – despite evidence to the contrary. 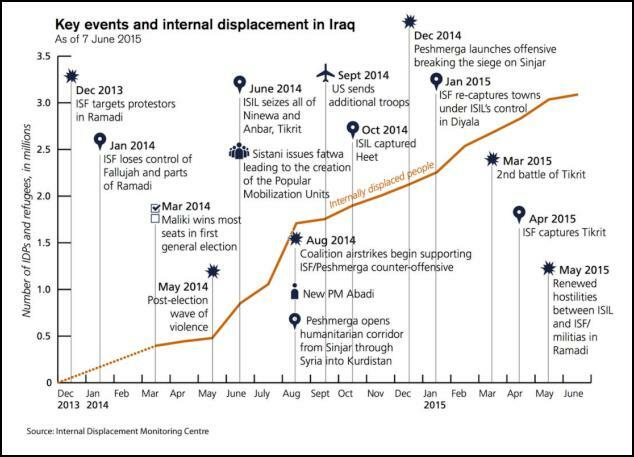 30 June 2015 – The Internal Displacement Monitoring Centre estimates “at least 4 million Iraqis [are] internally displaced as of 15 June 2015”, one quarter of whom were displaced between 2006 and 2008 during the Iraq War. 5 July 2015 – Al Jazeera reports “[a]t least 73 people have been killed in the western Iraqi cities of Ramadi and Fallujah, as the Iraqi government stepped up air strikes and artillery fire against [ISIS]”. 13 July 2015 – The UN releases a report on protection of civilians in the Non-International Armed Conflict in Iraq, noting that “[c]ivilians continue to be the primary victims of the ongoing armed conflict in Iraq”. The UN has recorded a total of approximately 45,000 non-combatant casualties (15,000 killed and 30,000 wounded) from 1 January 2014 to 30 April 2015. As the UN acknowledges, the casualty figures are conservative and under-report the actual number of civilians killed and injured. 1 August 2015 – The president of Iraq’s Kurdistan region condemns Turkish airstrikes that killed civilians in the village of Zarkel in northern Iraq.